The first half of the I-League is nearly complete with most of the teams have played nine matches. 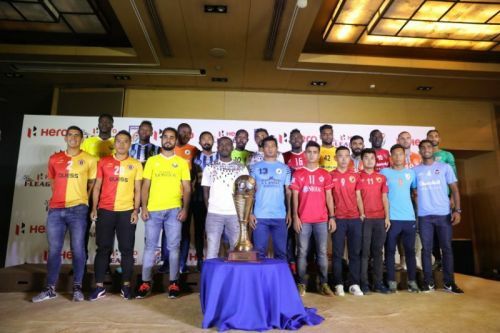 This edition has produced some mouth-watering battles, some of which are even better compared to its competitor Indian Super League. Kolkata giants Mohun Bagan and East Bengal started as favourites again in this season but both them witnessed topsy-turvy campaign so far. Mohun Bagan were held in their first two matches before registering their first win against Indian Arrows. They lost again to Churchill Brothers and after a lone draw against Chennai City, they went down against arch-rivals East Bengal, before winning against Minerva Punjab. East Bengal, after winning their first two matches, lost three in a row. But they turned their campaign back on track in a fashionable manner after making a hat-trick of wins, including Mohun Bagan. But Chennai City FC’s performance has surprised everyone. Finishing on the eighth position in their last two campaigns, Chennai City FC have started making their team much before others. Singaporean coach Akbar Nawas and his former assistant Jordi Villa handpicked players from lower divisions in Spain. They move is reaping rich dividends for the team, which is the only team to remain unbeaten this season. Honourable mentions: James Kithan, Wayne Vaz, Edwin Vanspaul, Hussein Eldor, Ajitkumar Kamaraj, Yuta Kinowaki, Alexander Romario Jesuraj, Laldanmawia Ralte, Katsumi Yusa, Surchandra Singh, Dipanda Dicka and Felix Chidi. Bilal Khan has been in some form this season. The Snow Leopards have conceded less number of goals this season and Bilal is certainly one of the main reasons for this. He had produced some mind-boggling saves this season to keep Real Kashmir unbeaten in some matches. Real Kashmir FC have kept four clean-sheets our of eight matches this season and along with their rock-solid defence, Bilal played a part too. Take the example of Mohun Bagan match. Real Kashmir FC may have lost that match by two goals but could’ve conceded more. Bilal stood like a rock under the bar and made countless saves to deny Bagan. Against NEROCA FC and Aizawl FC too, he played an influential role. The Uttar Pradesh-born is a veteran custodian plied his trade with clubs like Churchill Brothers, Hindustan FC, Gokulam Kerala FC and with ISL club FC Pune City from where he is currently loaned to Kashmir.